Social Forum Journey » Khimki victory: Maxim Solopov released! Moscow and antifascist accused of actions in connection with the Khimki forest conflict is great news. Now we have one more possibility for historic victories against repression this year after the sentences stating that two spokespersons for Climate Justice Action in Copenhagen were not guilty. In both conflicts problems still remain. We have still not seen the end of the trials in Denmark and some 200 people were detained or interogated by the police in the repression wave after the Khimki conflict escalated. Gaskarov is still detained. In both cases is neither the high way through the Khimki forest conflict or the much harder issue climate justice solved. But there is the possibility that some kind of repression in connection with summits as well as local environmental conflicts have reached a stage were the authorities cannot go to far. In the Russian case due to an extraordinary commitment from very different domestic actors to unite in solidarity against the repression, in the case of Denmark and the climate summit there was rather a lack of solidarity among domestic actors but the juridical system could not accept the extremist views put forward by the police which actually had backing from much of the political parties. The Danish state imploded when trying to combine the extremist authoritarian measures by the police and traditional Western juridical arguments. In both cases international solidarity was helpful. Here both social forums and the climate justice movement have done very well. We may think we are small sometimes, and facing the present social and ecological crisis this feeling can be seen as justified. But we should keep in mind that also if we see ourselves with these eyes there are times when solidarity can arise. It is important ahead of COP-16 in Cancun and the future of local social and environmental conflicts what have happened in the struggle against repression this year. To me it is especially inspiring how Russian movements have been able to cooperate. They have been an example for the rest of the world. May we be able to follow their example and unite in solidarity across different ideologies whenever it is necessary to stop repression. Thankyou everyone that contributed to the victories. 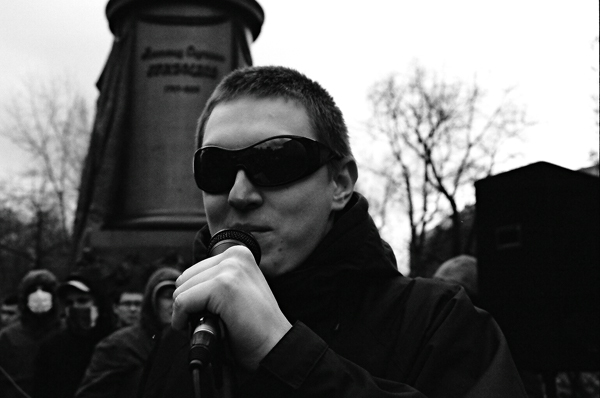 release Maxim Solopov from the arrest immediately in the court room. professors Galina Yershova, Dmitry Belyaev and Yekaterina Di Santo. present at the court hearings. that he is also an antifascist». on these photos, Yermilov couldn’t provide any proof for his statements. the unprofessionalism of the law enforcement agencies». Maxim Solopov from the arrest. things that we did», said Lev Ponomaryov following the court ruling. protocols of Maxim’s and Alexey’s detention were also falsified. the Khimki court some time before October 27.